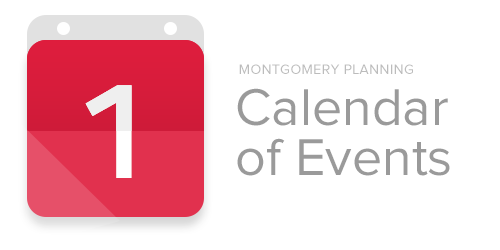 SILVER SPRING, MD – The Montgomery County Planning Department, part of The Maryland-National Capital Park and Planning Commission, is pleased to announce its December 2016 calendar of events. These meetings offer opportunities for the Planning Department staff to discuss policies and engage with the public. Review the full list of events and ongoing plans and projects below and go online to www.montgomeryplanning.org for more details. December 1 – Attend the public hearing for the Rock Spring Master Plan at the Planning Board meeting (8787 Georgia Avenue, Silver Spring, MD). Consult the Board’s online agenda for details about the hearing. To testify, sign up online or submit written comments. December 2 – Learn about public art and placemaking at a presentation given by speaker Paula Rees, a Seattle-based designer, at the Planning Department (8787 Georgia Avenue, Silver Spring, MD) from 3 p.m. to 5 p.m. Following the event, attendees are invited to a networking happy hour at the Sheraton Silver Spring Hotel (8777 Georgia Avenue, Silver Spring, MD) next door to the Planning Department to continue the discussion in a more casual setting. Confirm your attendance on the RSVP list. December 5 – Attend the next community meeting to discuss possible regulations for short-term residential rental units, like Airbnb, from 7 to 9 p.m. at the Planning Department headquarters (8787 Georgia Avenue, Silver Spring, MD). Provide feedback on the draft language for the new regulations that will eventually be included in the zoning code. Learn more about this project. December 15 – Planning Department staff will meet with the Silver Spring Citizens Urban District Advisory Committee at the Silver Spring Fire Station No. 1 (8110 Georgia Avenue, Silver Spring, MD) starting at 4:45 p.m. to discuss the Silver Spring Streetscape Standards. The public is welcome to attend. Learn more about the streetscape standards. December 22 and 29 – The Planning Board will be on its holiday break and will not hold meetings on these days. The first Planning Board meeting of 2017 will be held on January 5.